On Tuesday, January 29th, New Columbia residents gathered to take part in a design workshop for a new bike skills park in their neighborhood. 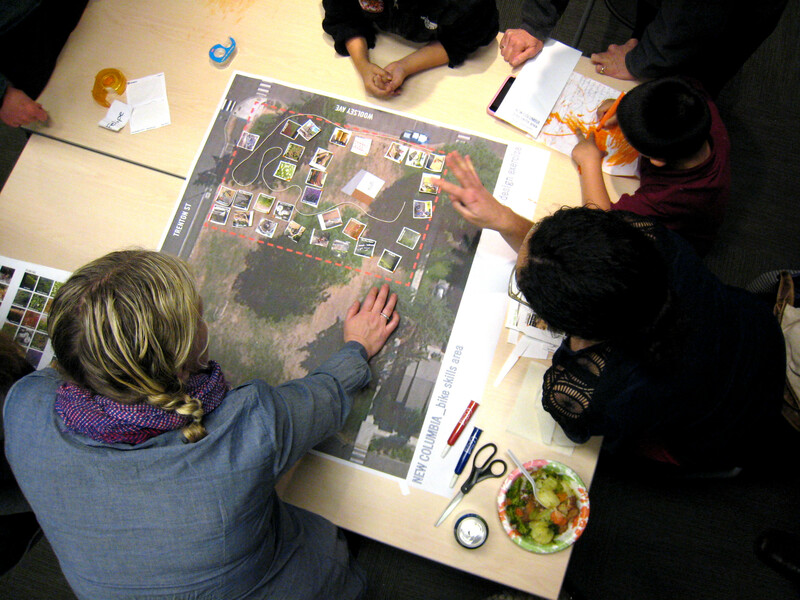 Landscape architects and planners from MIG, Inc. facilitated the event and worked with community members to come up with creative bike skills park designs. Christina, Jonathan, and Rachel, three representatives from MIG, kicked the evening off with a site analysis and reminded residents of some important things to keep in mind, like sun/shade patterns and drainage, when putting their designs together. MIG provided paper cutouts of an array of park elements for residents to place on large site maps. Residents worked in groups to create their collaged vision for a bike skills park in their neighborhood. Square pieces of paper became flower-laden hedges or shady park benches, and various lengths of string marked the placement of paths made of compacted gravel or bark chips. Toward the end of the evening, each small group shared their design concepts. A group of teens from the Boys & Girls Club were the first to share their vision for a bike park they will some day use. Other groups listened and watched while hurrying to place one more bench or one more length of trail. We would like to send a big “thank you” to the folks at MIG for facilitating the event. We also want to thank all the New Columbia residents that came out and offered their input.